The following report has been prepared from a very complete draft received from the Convention Secretary David Archibald. All photographs are to the credit of Phil Breaden. This year, the Australian Association of LiveSteamers' Convention, the 25th, was hosted by the Sydney Society of Model Engineers Ltd. on their 25-acre rural property at St. Marys, on the western outskirts of Sydney and about an hour's drive from the city center. The year 1981 is a very significant one for the S.S.M.E. Being founded in 1906, it is the 75th anniversary of the Club and also the 10th anniversary since the opening of Model Park at St. Marys. Previously the club was located at Ashfield in Sydney's inner suburbs. S.S.M.E. must be one of the oldest clubs in existence, with the possible exception of the original Society of Model and Experimental Engineers in London, a fine record of service to our hobby. The S.S.M.E. caters for all aspects of model engineering including radio-control boats and aircraft, race cars and slot cars, HO model trains and, of course, Live Steam from 2½" to 12" gauge. The lake for model boats is approximately 2½ acres in area. Photo 1 is a general view in which can be seen the lake, tracks, steaming bays and the camping area. There was a great deal of work done to extend the tracks in the eighteen months before the convention; the last section was completed only about a month before Easter, leaving just enough time to iron out any "bugs". The result was a very smooth-riding track and was much appreciated by the visitors. Visitors to the Convention came from all over Australia and a couple from New Zealand. Some travelled in excess of 3,000 miles to be present. There were just short of 450 people registered and a general attendance of 1200 over the four days. The early arrivals started unloading on Wednesday and Thursday, and by Thursday night the steaming bays were already nearly full. There was a total of 110 locos and 5 traction engines. 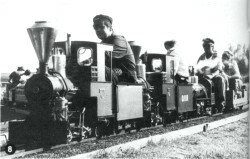 The locos were made up of two 12" gauge, two 8" gauge, ten 7¼" gauge, sixty-seven 5" gauge, twenty one 3½" gauge and eight locomotives whose details were not recorded. Running started at 7:30 a.m. on Friday and was more or less continuous for the whole weekend. Running on Saturday night (or was it Sunday morning?) stopped at 5:30 a.m. only because a thick pea-soup fog reduced visibility to zero. Other than the fog, the weather was perfect for steaming with the temperature in the mid 20s (°C) (70°F) and a cloudless blue sky most of the time. Better weather could not have been ordered. Saturday afternoon saw the Convention officially opened by the President of S. S. M. E., Karl Sepatauc, who extended a warm welcome to all the visitors. This was followed by much whistle blowing and then the Grande Parade. Mary and Colin Wear drove their full-size 7HP Fowler traction engine to St. Marys in a 4¼ hour trip for the Convention. The engine created a great deal of interest, particularly when it generated the electricity to illuminate the marquee in the evenings. On Friday night, the flat belt drive to the generator broke leaving the place in darkness. 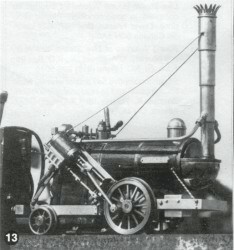 However, a 3½" scale traction engine chugged down to the rescue and generated enough light to enable repairs to be carried out amidst comments of "cheeky little so-and-so". A trophy was awarded to the most popular locomotive present. The S.S.M.E. Trophy was judged by secret ballot and won by Ray Lee from the Sydney Live Steam Locomotive Society. Ray's loco (Photo 2) is a model of the New South Wales Government Railways C35 class in 5" gauge. This is a superb model, painted blue with a black smokebox (a color scheme only seen for a very short time on the N.S.W.G.R.). The locomotive performs as well as it looks. 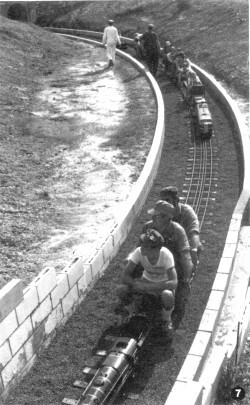 It appeared on page 59 of November 1980 Live Steam as it appeared for its trial run. 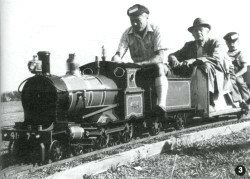 Photo 3 shows George King driving his free-lance 12" gauge 4-4-0, No. 4174. Behind George is S.S.M.E. 's oldest member, Sam Mears, still an active Live Steamer at 97 years young. Another S.S.M.E. 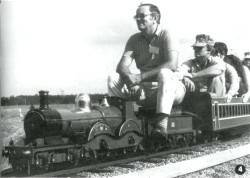 member, John Hagan, is seen in Photo 4 driving his 7¼" gauge Dean, Armstrong class loco Gooch. John's new set of gondola coaches made up the train. With so many locos present, space in the steaming bays was ata premium. Photo 5 shows the scene. Another view in the steaming bays (Photo 6) shows Barry Glover's 5" gauge N.S.W.G.R. 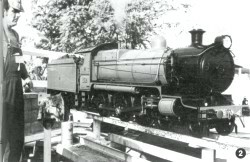 C.32 class. Some of the traffic is seen in Photo 7. This is part of the new extensions and the tunnel portal can be seen in the background. The boys from the Diamond Valley Railway (Melbourne, Victoria) were well represented. Photo 8 shows Richard Hays leading a triple header on his 7¼" gauge loco, Elfride, a model of a German industrial 0-4-2 engine. Behind is Bill Pert's almost identical Helga. Both these locos are fitted with the Briggs-type steel stay-less boiler. Following is the D.V.R. 's Club loco. 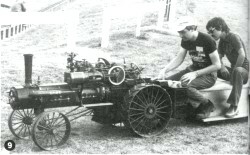 Lindsay Drabsch brought his 3½" scale, 65 HP, 1915 Case traction engine (Photo 9) all the way from Canberra. In this photo, David Archibald, the very capable Convention Secretary, is at the controls. 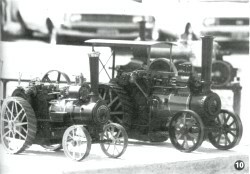 Two smaller scale traction engines can be seen on display in Photo 10. 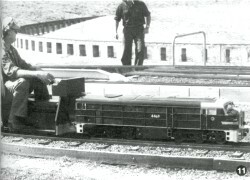 There were several diesel locomotives present and one of these is shown in Photo 11 where John Hill (Blue Mountains Railway Society) is driving his 5" gauge model of the N.S.W.G.R. 44 class. 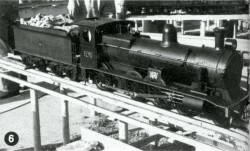 In Photo 12 is seen Niel Allen's 7¼" gauge model of the Victorian Railways 2' 6" gauge NA class 2-6-2. This is the class of locomotive which operates the famous Ferntree Gully tourist railway which runs on the lower slopes of the Dandenong range, just north of Melbourne. Niel travelled from Melbourne for the Convention. Photo 13 is of a very fine 3½" gauge model of Rocket by Tom Burns of the Lake Macquarie Club. The opportunity is taken during convention time, when most Clubs are represented, to hold two important meetings. Friday evening is given over to the boiler inspectors for the Australian Miniature Boiler Safety Committee meeting so that all matters relating to boiler inspection and safety can be reviewed. On Sunday morning, delegates gather for the A.A.L.S. meeting which deals on a national basis with matters other than boiler safety. The benefit from these two gatherings, which represent the widest aspect of our hobby, have been, and will continue to be, of great benefit. The 25th A.A.L.S. Convention was undoubtedly the largest gathering so far held, both in the number of people and the locomotives present. It was fortunate that the extensive property of S.S.M.E. was the venue. The Convention, and the organization behind it, was a great success and a credit to the host Club and to the organizing Secretary, David Archibald. Although the gathering at S.S.M.E. concluded on the Easter Monday, invitations had been extended by other Clubs in the State of New South Wales to all present and, as a result, Cinders and Soot were in evidence for the remainder of the week: Tuesday at Hornsby and District, Wednesday at Sydney Live Steam Locomotive Society, Thursday at South Coast Model Engineering Society, Friday at Blue Mountains, Saturday at the 12" gauge private track of Arthur Birch at Warner Vale and finally on Sunday at the Lake Macquarie Live Steamers at Edgeworth. 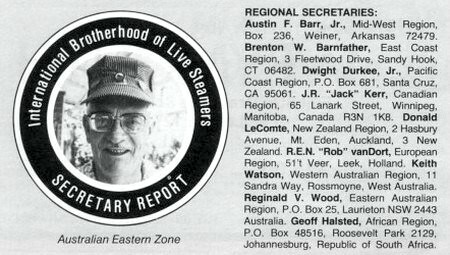 Next year's Convention 1982 will be hosted by the Queensland Society of Model & Experimental Engineers at their grounds at Strathpine, north of Brisbane. The Secretary's address is 5 Garfield Street, Nundah, Queensland, 4012. This article was first published in the US magazine Live Steam in the Jul 1981 issue (Vol 15, No 7, pp60-63), from material supplied to IBLS by the SSME.